Few figures from Latin America have been as polarizing as Venezuelan President Hugo Chavez, who has been characterized as everything from a visionary to a monster. While Venezuelans have recently slapped Chavez down when he attempted to grab more power, he’s likely to be on the world scene for years, buoyed by popular support, strategic Latin American allies, and billions of dollars in oil revenues. Although he’s a U.S. nemesis on several fronts, even famously calling Bush “the devil,” the United States can’t afford to try to isolate Chavez, as it has sought to do to Cuba’s Fidel Castro. A key reason: the United States is dependent on imports of Venezuelan oil, a little more than a million barrels a day. Chavez’s brashness, mischief, and mastery of public relations was exemplified in his offer of free heating oil to poor U.S. families. The bait was so irresistible that even New Hampshire---the lone hold-out among Northeastern states to Chavez’ munificence---has finally accepted the offer with the prospects of heating oil reaching $5 a gallon this winter. Previously, New Hampshire Republican Sen. John Sununu had characterized Chavez’s offer called it a “disgrace” and an attempt at grandstanding. Now, he’s warmed up to the idea. Bush administration foreign policy has been distracted by wars in Afghanistan and Iraq. It paid Latin America and emerging Latin leaders like Hugo Chavez scant attention. In Chavez’s case, Washington has done little more than spit out condescending tongue-lashings and imposed a few largely impotent sanctions. But tensions ran so high in September that Chavez ejected the U.S. ambassador. And in an eerie flashback to the Cuban Missile Crisis, Venezuela engaged in joint naval exercises with a newly belligerent Russia. Chavez, 54, is the son of poor schoolteachers. Along with fellow students at Caracas’ Simon Bolivar University , Chavez developed a leftist, nationalist doctrine he called “Boliviarianism” after the Latin American revolutionary. He also is a career military officer who took advantage of popular dissatisfaction with the administration of former Venezuelan President Carlos Andres Perez to stage a coup attempt in 1992. It failed and Chavez was jailed for two years. But the incident propelled him into the public eye. He eventually won power in a democratic way, winning 1998 presidential elections with 56 percent of the vote. Since then, Chavez has worked to consolidate his power through new constitutions and referendums and has nationalized key industries and expropriated foreign oil companies. 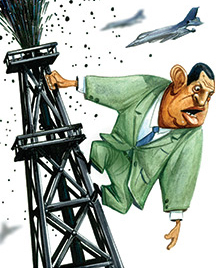 Venezuela’s own oil industry had already been nationalized in the early 1970s. But after a two-month strike in 2002 aimed at forcing him out of office, Chavez fired all of the managers of Petroleos de Venezuela S.A., or PDVSA , and 18,000 of the company’s employees. Chavez’s critics say he destroyed Venezuela’s economy, its middle class and entrepreneurial spirit. They say he’s a despot, hungry for power, who wants to poison the rest of Latin America with his anti-capitalist and anti-U.S. spirit. His defenders say he’s a complex person who has his faults, including a seeming lack of self-censorship. But his goals of unifying Latin America and helping its poor, and the destitute in other nations, is commendable, they say. Chavez has, largely through his many missiones, funneled billions of dollars into social programs for his fellow countrymen. Venezuelans who didn’t know how to read are graduating from high school today and those who have never seen a doctor are receiving free medical care.His largesse has extended to other Latin nations and beyond---he’s even subsidizing subway fares of the elderly in London. Chavez’s generosity helped him forge ties with Latin neighbors. His offer of subsidized oil to Caribbean nations has lured even staunch U.S. allies like the Dominican Republic and Costa Rica. Chavez’s regional energy cooperative, Petrocaribe, allows fuel-starved Caribbean nations to buy Venezuelan oil at just 40 percent of the world market price and pay back the difference over 25 years at one percent interest. A key event that defined Chavez’s relationship with the United States is a 2002 coup that resulted in the Venezuelan leader’s capture by rogue military leaders and the appointment of businessman Pedro Carmona as interim president. Carmona’s administration was short- lived, however. Two days later soldiers loyal to Chavez mounted a counter-coup, freeing Chavez from his captivity and returning him to power.The botched coup resulted in a huge rift in already rocky U.S.-Venezuela relations. More than anything, it’s Chavez’s relationship with Fidel Castro that propelled the Venezuelan leader to a place on the U.S. checklist of global bad guys. Chavez’s Boliviarianism – his vision of a united, socialist Latin America – and Castro’s Communist -inspired nationalism are an almost perfect ideological fit. That relationship , which manifested itself as Castro the mentor and Chavez the dutiful acolyte, was cemented by a shared hatred of “neo-liberalism” and contempt for the United States. In better times, Chavez and Castro would trade neo-liberalist jokes on the Venezuelan television call-in show Alo Presidente. Now Chavez is one of the few people an ailing, and probably dying, Castro will agree to still see. Their relationship was fostered early in Chavez’s presidency and sealed by oil. Venezuela gives Cuba about 100,000 barrels of oil daily at subsidized rates, while Cuban doctors staff newly created clinics throughout Caracas. That may be so, but the oil lifeline Chavez tossed at Cuba’s struggling economy dismayed Cuban-American policymakers like Otto Reich. They sought to isolate the Venezuelan leader and condemn Chavez as a terrorist, accusing him of aiding Columbia’s FARC rebels and fostering other notorious ties. But such branding and efforts to isolate Chavez, successful for decades against Fidel Castro, had mixed results because of U.S. dependence on Venezuelan oil. A campaign by Cuban American lawmakers Reps. Ileana Ros-Lehtinen, Lincoln Diaz-Balart and Mario Diaz-Balart – all Republicans from Florida – to add Chavez to the State Department’s list of state sponsors of terrorism floundered. In fact, U.S. policy toward Venezuela appears to have become more thoughtful in the waning days of the Bush administration. Shifter attributes the improved approach to one man: Thomas Shannon, the State Department’s Assistant Secretary for Western Hemisphere Affairs. “He’s smarter and more moderate,” Shifter said. Some of the steps the Bush administration took to punish Chavez included declaring Venezuela to be “not fully cooperative” in the fight against terrorism. That claim stems from Chavez’s denunciations of civilian casualties that were the result of U.S. bombings in Afghanistan after the 9-11 attacks and his relations with Iran. The United States also prohibited Venezuela from buying U.S. weapons, arrested Venezuelan agents and cut off Chavez’s credit with several international lenders. But Shannon said there is a glimmer of light. He said that Venezuela, for the first time in years, has expressed a willingness to explore improved relations with the United States and that Chavez is indicating he wanted to improve cooperation on counter-drug efforts. “We have told Venezuela we would like to explore this diplomatic opening,” Shannon said. As he carefully watches the U.S. presidential election, Chavez is facing his own test at the polls in November. Although he is not on the ballot---Chavez’s second term in office ends in 2012---gubernatorial and mayoral elections will be held in Venezuela on Nov. 30, testing his opposition’s strength. Chavez’s critics say he’s been wounded by the failed referendum in December 2007, which would have abolished term limits, allowing Chavez to hold office indefinitely as long as he is re-elected and the country more toward socialism. Chavez has said he should have full authority over the autonomous Central Bank as well as the nation’s economic policy. But the referendum’s margin of defeat was slim, 51-49 percent, and Chavez is not going away anytime soon. He plans another referendum in 2010 that would open the door for a third term. He says he’s learned from his mistake and plans to spend more time explaining the goals of the next referendum to the Venezuelan people. Chavez retains enormous popularity at home, especially among Venezuela’s poor. And there are few candidates on the horizon with the stature to challenge him. Chief among them is Leopoldo Lopez, 37, the boyish mayor of our central Caracas, a rich district. Lopez, a Harvard graduate, is the darling of conservatives in the United States and many anti-Chavistas in Venezuela. But complicating matters is that he has been banned from running for office again by Venezuela’s national electoral council, grouped with nearly 400 other blacklisted politicians accused of corruption or administrative offenses. But Lopez, a center-leftist, is young and ambitious. He was able to make his case that he’s a viable alternative to Chavez to Obama this summer in a brief meeting in Miami. Regardless, Andres Martinez, a senior fellow at the New America Foundation, said the next U.S. administration should not pay Chavez too much mind. He says Chavez is “a class clown” on the world stage, eager for attention.“A certain amount of benign neglect goes a long way,” Martinez said. Chavez has developed close relations with the Brazilian President Luiz Inacio Lula da Silva, Nicaraguan President Daniel Ortega, Bolivian President Evo Morales, Ecuadorian President Rafael Correa, Argentine President Cristina Fernandez de Kirchner, and other Latin leaders. But a centerpiece of Chavez’s presidency, the proposed Bolivarian Alternative for the Americas, known as ALBA, that would be an alternative trading block to a U.S. plan to unite the hemisphere economically, has not gathered strength and has only three members: Cuba, Nicaragua and Bolivia. Martinez said Chavez’s influence in the region is waning and Latin countries will increasingly strengthen diplomatic and trade ties with the United States. He also said Lula is eclipsing Chavez as Latin leader. Ana Radelat lives near Washington, D.C.